The Bongo is a Japanese people carrier. And it carries Japanese people. It can also carry people from other nations too. Although I suspect you can squeeze in twice as many Japanese than you can Tongans. I’m no expert, but a Bongo is the UK endearment for a Japanese Mazda people carrier that’s been converted into a campervan. They generally date from around the mid 1990’s and are imported either already converted or you can get them done here in the UK. Pricewise, they’re comparable to a VW campervan, but obviously the interior is more likely to be brand spanking new and the chances are you won’t be able to see any of the wiring. That said, I have come to realise that it’s actually quite important to have exposed wiring in the bus simply because of the frequency with which you need to fix something. It would be unfair to draw like for like comparisons between the Bongo and the Bus, but suffice to say both have fanatic fan clubs that do tend a little towards the geekish side. And, both the Three T’s (Tom Tom & Teblis) and the SaPa.Co (Sarah Paul & Conker) were keen to hook up and check out each others sleeping arrangements! 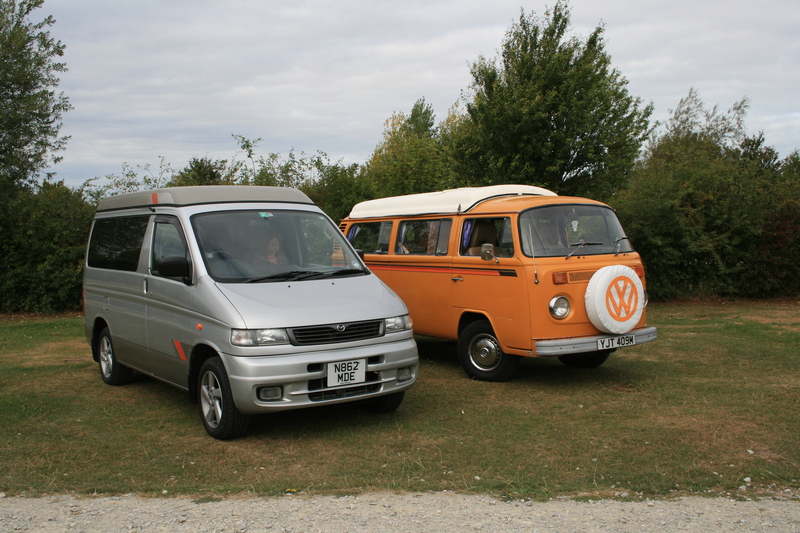 For our maiden Bongo-Bus get together we met at some campsite along the north Kent coast just outside Whitstable. Sarah wrote a review on the actual campsite – it claims to have an award for the best campsite loo of the year no less. Imagine this. Both couples are as proud as Larry showing off their prized campers and yet at the same time they’re itching to get a butchers inside each others beauties. 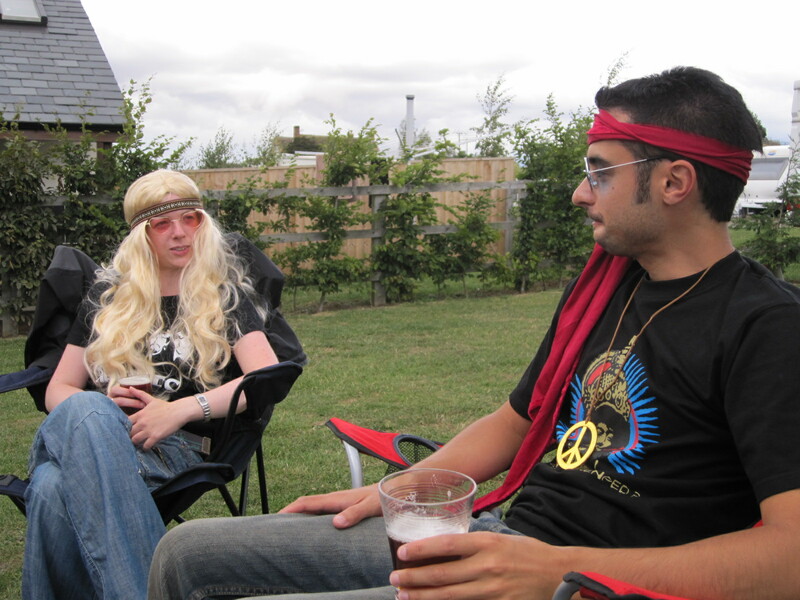 To be honest, I wasn’t that pleased at Sarah and Teblis likening myself and Tom to a pair of campers. But then again, I’m not sure the ladies were that enamoured at the thought of a couple of us itchy types spying through their peep hole……….. I digress. I said I wouldn’t do the comparisons, but we obviously there were long discussions about the differences between Bongo & Bus. For the sake of argument, let’s assume the following characters: Bongo Tom – Bongo driver and all things gimmicky. Teblis – Tom Tom’s blade who uses hair straighteners when her hair is already pretty straight. Sazbo – aka Sarah, her real name that everyone else calls her except me. Expert map reader. Me – VW driver, programmed to follow instructions. An unusual characteristic for a bloke. Bongo Tom Hey, nice camper. A real VW camper – wow. Me Nice Bongo – a real life Bongo – wow, so shiny. Sazbo Hi Tracey, so good to see you, how’s work? I like your new haircut – how do you keep it so straight? Teblis Oh I use straighteners, Tom hasn’t even noticed I’ve had it cut yet. Sazbo Well he wouldn’t would he. Where did you get that top from? Teblis Well…I was out shopping one day and…..
Bongo Tom Can I take a look inside. Wow, its got seats. Do these fold into a bed? Bongo Tom You’ve got a sink! Is it plumbed in? Bongo Tom You’ve got wires! Me Yep, loads of them. Some of them have electricity coming out of them too – like that bare exposed one up there. Why don’t you touch it. Look at this. If I push the roof here the top pops up. Bongo Tom Wow. Come and have a look what the Bongo does. If I press this the roof opens electronically. Djuuuuuhhhh uh. Me How cool is that. You’ve got a sink! Is it plumbed in? Bongo Tom Uh huh. Hang on a minute, is that the VW logo on your wheel hub caps? Me Oh yes. Proof that it is a VW……..
Bongo Tom What’s that smell? Me Petrol. Fancy a beard? Bongo Tom yabba dabba do mate. What are the girls talking about? Me Dunno – There’s something different about Teblis. What’s she done to her head? Bongo Tom Dunno, why? Does it look different? A beard, by the way, is another name for a beer. The ‘lost in translation’ comes from my nephew, Barns, who though the words beard and beer were the same. Something to do with his Grandad, who’s my dad, having a beard and always drinking beer. “Is Grandad drinking a beard again?” That’s right Neph, Grandad is drinking a beard. So beard it became and beard it stuck. Later that night dinner was reheated in the Bongo kitchen, we ate outdoors, and then retired to the bus where we played cards. A game called Palmer, named after Sarah’s dad who taught us the rules. Its a simple game and its fun (when there’s nothing else to do on a campsite and its dark). Bongo Tom Another Bongo Beard mate, brought to you chilled by the Bongo fridge? Teblis/Sazbo Do you two ever stop talking rubbish? This entry was posted in The SapaBus Blog and tagged Bongo, campervan refit, Camping, Home Park, Kent, VW Bay, VW Campervan, Whitstable. Great post – I learned something too… the origin of beard=beer! Ah, but d oes your horn ‘beep’ or does it sound like a clown’s nose?